Werner’s agenda throughout the film seems to be to pull apart Tim Treadwell (as if he hadn’t already been pulled apart by bears…) and it’s not clear whether or not this is a result of Herzog’s encounter with Tim’s tapes, due to his fascination with the man’s ending, or whether Herzog has an argument with Treadwell’s naive and childish love of the animal/human kingdom. The kid mistakenly embraced the wild, thinking he belonged to it, simply because he couldn’t fake it any more in the society of man. But Herzog takes this out on the subject of the film. His compassionate appearance as witness to the taped “murder” (to Herzog, bears can be murderers — and he accuses Treadwell of projecting?) is false — it’s a cheap attempt to take the subject’s side, and it neither goes far enough to establish his sincerity nor far enough to establish his presence as an essayist, not a documentarian. Herzog’s instincts as an image maker are among the best in the industry. But his exploitation of subject matter, a criticism wagered many times at his ability to create human tragedy among his actors and crew, is on screen in Grizzly Man, and left me queasy as I’m sure it has done many. This film ought to be refiled. Perhaps under “fictional biography” (next to the movie they’ll be making of Frey’s Million Little Pieces). 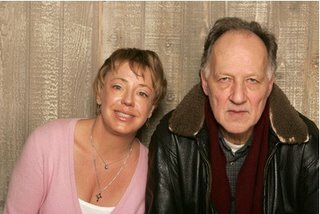 Herzog has an agenda, as a filmmaker, and as a documentarian. Does Oprah have a film club?